Over the past few days, I’ve been working on getting trees and shrubbery in. After consulting with the knights who say “Ni!” about shrubbery, I was able to wring some halfway decent looking plants and trees using Unity’s built-in tree editor. 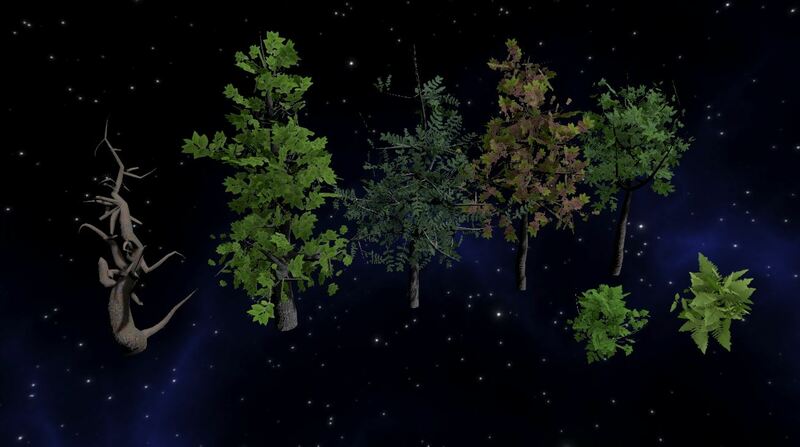 Their tree editor is nowhere near as nice as SpeedTree, which is what I am used to working with during my video game programming days, but for the purposes of this game, I think it works OK.
I’ve created 5 different tree types and 2 different shrubbery types. In the original game, they were called “producers” which I guess meant they produced fruit or something. I took a video of the terrain vehicle exploring the liquid planet at 123,101 around the lower elevations. The vegetation favors the lower elevations – they become less common the higher up you go. Next, I think I will need to work on the mining system (terrain vehicle cargo hold). I think that is one of the last major bits before the game will become truly playable, as far as gathering elements and selling them at Starport to get money to upgrade your ship. Great work on the vegetation. Do you need more? If so, I can help. Been creating trees, flowers, etc. in some environments myself. Let me know. Hello! Are you able to create the vegetation within Unity (native Unity trees)? If so, great! Yes, I can always use some more. Especially the alien looking stuff. Yes, I use the builtin tree maker of unity. I have a sample HTML5 Video on my website ( http://www.jfdhobbies.com/MountainBayIsland/index.html ) if you want to take a look. I will come up with some alien looking plants. I need to know the height of these plants.. Usually I use the default size (x,y,z) as 1,1,1. Also, how do I get these plants to you? Hmm – the link doesn’t work (the video just sits loading forever). After you create the trees you can go to Assets > Export Package… and select the tree objects and all of their dependencies (materials and texture maps) and it’ll create a file you can send to me and I can import it directly into the game. I will do the same right now and send you the trees and shrubbery I have so you can scale yours to match. Also one additional piece of information you’ll need – the maximum height of the new trees should be around as tall as the existing trees. Any taller and they could poke through the player’s ship floating above the terrain. There are 4 different planetary types that can have trees – (1) Molten, (2) Frozen, (3) Liquid (Earth-like), and (4) Rocky. Having a different set of trees for each one would be awesome. For example, frozen would have icy or snow covered trees. Molten would have I guess spiky or trees that look like they can withstand heat. Each planetary type should have a minimum of 2 big trees, 2 medium trees, and 2 shrubberies, but more is better for variation. 1. Unknown shader channel count. 2. Broken YAML file(Assents/Game Objects/Trees/Tree 1.prefab). :pca; Fo;e odemtofoer )167727435376924321_ dpesmt exost! There are 198 similar total error messages. b) Transform component could not be found on game object. Adding one! …. and many more. Also no textures appear. However I don’t need them. All I have to do is compare the sizes of trees and shrubs. I was able to place the Terrain Vehicle in, and a few trees that I have created were about the same size or slightly smaller than the terrain vehicle. This is very strange. The package imports without any issues, that is, no hangups or freezes, yet there are no prefabs to load in, and all these error messages show up. It allows me to clear these however. I will download this package again tomorrow evening when I have more time and try again. Perhaps something happened during the download – maybe a glitch or internet issue. Hmm – I just tested it myself and it seems to work OK. What I did was create a brand new Unity 3D game, then went to Assets > Import Package > Custom Package… and selected the CurrentStarflightVegetationAndStuff.unitypackage file. Imported everything without any errors or warnings. Then you can go into the Assets/Game Objects/Trees folder after import and just drag in “Tree 1” through “Tree 5” into the scene. You can also drag in “Shrubbery 1” and “Shrubbery 2” into the scene, as well as “Rock 1” thru “Rock 9” and all of the elements from their respective folders. The TV does come in without its shader because apparently Unity is not smart enough to automatically include custom shaders with materials that use them, but it isn’t necessary for the purpose of scaling. The tallest tree I have is about 2.5x as tall as the TV. I re-downloaded the unity package file, and it installed without any problems. Something must have gone wrong in last night’s download. Interestingly the trees that I created already match in height, so I’ll start making more of them, ( tall, medium, and shrubbery the same height you have in yours. I’ll make several sets and break them down in size. The defaults sizes for the big trees (x,y,z) shows as (1, 1, 1) in the tree maker, so they should all fit. When I’m finished with one set, I will create the package like you did, and provide a link where you can download them and see it they are ok. Thanks. Wow! Thanks for doing this for us Joseph!! Look forward to seeing what alien shrubbery you come up with haha! Not sure you will receive this, but I think the community forum is down. I log in ok, but none of the links work. I get a 404 message – page not found error. I uploaded the remake of the original shrubbery/trees now HiRes but could not place the link in the Development section. None of the other topics were found either (404 errors). Hope its ok to place the link here. When the board is fixed, this link can be bumped to that section for continuity. Here is the link to the updated original shrubbery to Hi Resolution. Thanks for letting me know about the 404 errors at the community forums. I think I have fixed it. Thanks for the updated stuff – I will put it into the game tomorrow. Looking forward to the molten planet plants!